Ultimate Image Quality - Superb 4K/30fps video recording and 20MP still images and RAW photos. Equipped with the latest Sony IMX269 Image Sensor, supports ISO up to 25600 to deliver the most accurate color and the finest image detail. Master Guide - With Yi M1 Master Guide makes a beginner shoots like a pro, with composition templates, auto parameters and auto photo editing you can learn fast and shoot professionally. 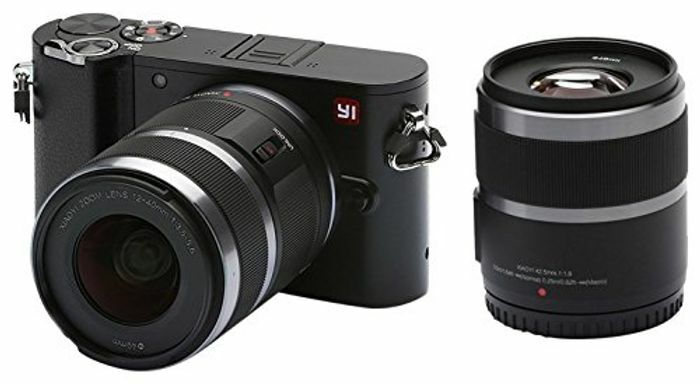 Vast Lens Availability - MFT mount (Micro Four Thirds) System, with two lens options from Yi: 12-40 mm F3.5-5.6 and/or 42.5 mm F1.8, and more than 50 other lenses options. High Connectivity - Built-in Wi-Fi and BLE Bluetooth for stable connection and fast sharing on social media, you can also quickly upgrade your firmware to the latest version 3.0 through the app. Supports shooting on the App remotely. Simple Design and Easy Handling - Sleek and simple body design, no compromise on features and functionality with only two physical buttons, the 3" touch screen LCD simplifies all camera operations, as easy as a smartphone and save the learning costs. This is actually quite a good deal with this camera & 2 lens if you're looking for a micro 4/3 system. Its not quite up to Panasonic & Olympus standards for the system, but they cost a lot more for the same camera & lens's.